Employers have seen the light with iPad applications. Employers have finally realized that employees can be constructive not only behind their desk, but when they are away from their desk. Apple is taking advantage of the tremendous growth of wireless access. They will be introducing updates to Keynote, Numbers and Pages in the near future. Their OS X and iOS office applications will use 3G and Wi-Fi to synchronize the work that employees do while on the move or at the office. Apple’s iWork applications have received raves for their quality and appearance, but many users prefer Quickoffice Pro HD. It dispenses with Keynote’s, Number’s and Page’s visual clutter in presenting a professional, clean interface. Quickoffice Pro HD integrates cloud synchronization supplied by Google Documents. Apple does provide separate applications in creating text documents, presentations and spreadsheets. Quickoffice Pro HD combines all-three. If you want to use more than two Apple applications, you will save by going for this app instead. Quickoffice Pro HD uses standard formats from the off, so there are no further requirements to go through when you want to share documents. Typically, when you do not have a net connection, you will work locally, but if you have a Wi-Fi connection or a 3G-enabled iPad, you can work from a remote server. The application allows for organizing files into folders within the app itself. The editing features prove easy and smooth, with various smart-navigation tools. If you take your thumb down the right-hand side of a text document and its constituent pages will be viewed as thumbnails. If you are working on spreadsheets, you will learn as you flip back and forth between pages, they will curve upward and downward similar to pages in iBooks. Another great feature with Quickoffice Pro HD allows for aligning cell data in the spreadsheet application. It provides a tic-tac-toe-type board which lets you drag sample text to align it right, left and center at the top, bottom or middle of the cell. If you make long-entries, they can be wrapped. Quickoffice Pro HD cannot replace your personal computer. The fonts are limited to seven in sizes ranging from 8pt to 72pt. The library contains 18 shapes that can be dropped into presentations. Sadly, the modules do not have the layout abilities of Pages, Keynote or Numbers. 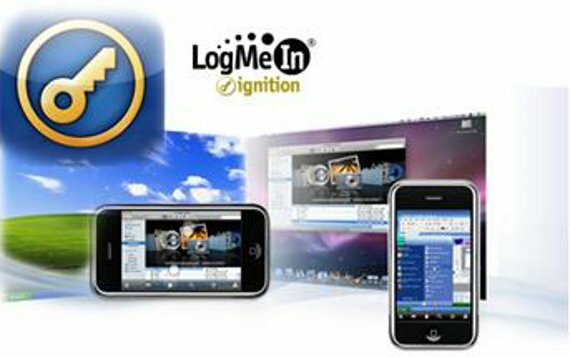 LogMeIn Ignition works in conjunction with a free utility for your personal computer or Mac. You can download and install it. It will check in with the LogMeIn website which updates the services servers with IP addresses and details of your broadband router. If you leave your computer on while working, or on the move and the client software on your iPad or iPhone will use the details to find the computer over the Internet, allowing you to see the screen while controlling both the remote mouse and keyboard. Did you forget to email a file? No problem with LogMeIn Ignition; simply log in from the nearest Wi-Fi connection and you can send the email out to your iPad. The program is worth the money. The time you save in not having to return to the office to obtain forgotten files makes the LogMeIn Ignition priceless and time-efficient. GoodReader is a catch-all viewer for Microsoft and PDG documents, Safari archives, iWorkfiles, video, images and audio. The elegant interface contains various features. The application contains a slider for changing the brightness of screens while allowing easy navigation that lets you slide easily through pages or set bookmarks and numbered locations. If you are reading a complex PDF document, GoodReader provides an alternative to clear out images, so you are left with just the text. This is a terrific way to keep up with reports that you might want to read on the train or bus on your way home. The program contains tools that are bunched together on a side-menu. The graphics prove unadorned with the ability to save to original files. When you finish your work, it can be compressed into a ZIP file. You can then email it to the application itself. This application is for anyone who needs to do a lot of reading for work. Wunderlist HD looks fantastic on virtually every stage. It allows you to set priorities and deadlines to assist in keeping on top of your professional objectives. Tasks can be organized into lists on the desktop version, as well. The application provides the capabilities to email your tasks to the Wunderlist servers. Penultimate is an impressive program that provides straightforward solutions in scribbling things down. With the aid of a stylus, you can directly draw on its pages. It contains 6 colors and 3 pen weights with 3 types of paper – graph, plain or lined. You can install other paper types free of charge from the in-app Paper Shop, where you will find other selection styles for nominal fees. Penultimate, is an innovative tool that is not only fun to use but useful in correcting mistakes. Plain Text contains various features and is one of the best writing applications available on the market. One of the great options with the application is that no formatting options, word counts, rulers or tools are available. You can do away with the sidebar and work with the workspace and ad banner that aids in keeping the program free. Plain Text hooks into Dropbox where you can save your work to the cloud. The app synchronizes with your personal computer or MAC. One really cool feature about the app is that every time you pause, the document will upload. Skype has been available for iPhone for a while now. The application is now available on the iPad where a larger screen display can be used in displaying contacts as thumbnails. IPadusers will find that Skype adds phone features to the device while decreasing mobile, international and landline rates. Evernote allows users to type notes while organizing them into folders. You can even back them up on the Evernote service. This program allows employees to write down quick ideas. The notes are filed by dates and indexed. You can arrange the notes into private collections called notebooks and describe those using strategic keywords to help you find them later. Evernote can be paired with the desktop client. It then allows for adding the Evernote button to your browser with clipping web pages directly into your account. It is one of the most expeditious ways to build up a digital scrapbook. SugarSync is similar to a hard drive. It can be installed on other devices; this means you and your friends can share the same set of data. The program lets you choose the folders that you want to synchronize on your personal computer. SugarSync will copy them to its own online storage while synching them together with your other devices. It proves a simple and easy way to get images onto your iPad when needing them for presentations and documents. Dropbox is an indispensable online storage tool. You can set all of your personal computers and MAC’s to log in, using the same information as your iPhone or iPad, and your wills will be synchronized between all three. If you create files while you are out and about, Dropbox-connected tools will have the files waiting on your hard drive when you get back to the office. This proves convenient, and increases security against losing your iPad, since your work will be back up on your computer and online. Dropbox is also a file manager and a first-class viewer. The program is free up to 2GB of storage. Great collection author. I like Skype. Its great for communication. I would like to place Skype first. To complete this list, I’d like to know what you think of the available keyboards for iPad. Typing on the screen is not really suited for work and I’m looking for keyboard solution. Hopefully it will be covered in a future post. I will pick Logmein ignition. It is a good remote support tool in addition to RHUB, Bomgar, TeamViewer etc.